At the World Economic Forum in Davos, Switzerland, this week, a presenter that Bloomberg called a "lonely analyst" predicted we're in for another major financial crisis in 2015. His prediction boils down to this: Nothing has changed since the last crisis. "The fundamentals haven't been addressed at all," he said. While the analyst, Barrie Wilkinson, focused on monetary policy and trade imbalances, the "nothing has changed" idea caught my attention. He's right that plenty hasn't been addressed. Bank regulation. Too big to fail. That's all still a mess. But if the financial crisis was caused by excessive consumer debt -- and hard to say it wasn't at least partially -- then the nothing-has-changed attitude falls flat. Truth is, consumers have cleaned up their acts considerably over the past three years. 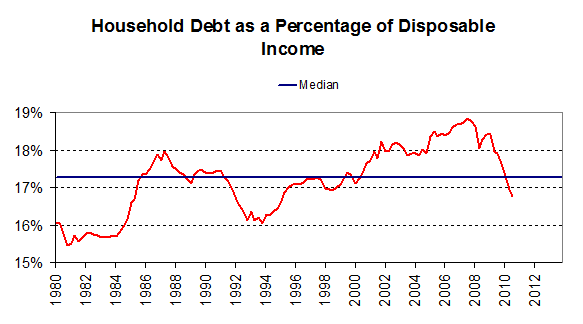 Household debt as a percentage of disposable (after-tax) income has fallen back to the same level it was at in the early '90s -- or even the mid-'80s. Today's level is well below the 30-year average. Hard to say nothing has changed with those kind of numbers. Two years ago, I didn't think such a massive turnaround was feasible. Reducing debt levels meant paying the stuff off -- something I figured would take years and years to accomplish at prevailing savings rates. Turns out that was wrong. Debt levels fell abruptly over the past two years because banks started writing it off as fast as they could -- faster, in fact, than consumers could reaccumulate it. This is an odd way to achieve deleveraging, but in the end it doesn't matter whether debt is falling because consumers are paying it off or because banks are forgiving it. The fact is we have less debt today than we did three years ago. Note the two spikes in 2008 and 2009. Those are temporary blips from one-time stimulus rebate checks. Ignore them. 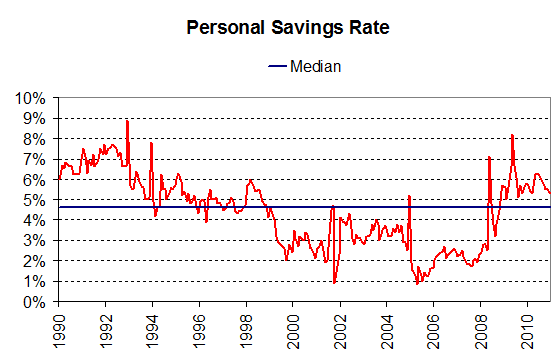 What's important is that the savings rate is now above the typical rate over the long run, and it's roughly six times higher today than it was five years ago. People are saving money again. Quite a bit of it. There's a good chance they'll save at even higher rates in the years ahead as pre-retirement baby boomers hunker down in their final working years. Be thankful for this. It's reversing two major contributors of the financial crisis: reliance on phantom home equity for financial wealth, and a mindset of living above one's means. The rate of homeownership has almost completely reversed its climb to insanity last decade -- a time when anyone with a central nervous system and a signature could own real estate. I'm always aghast at the number of politicians who regard this as a bad thing. 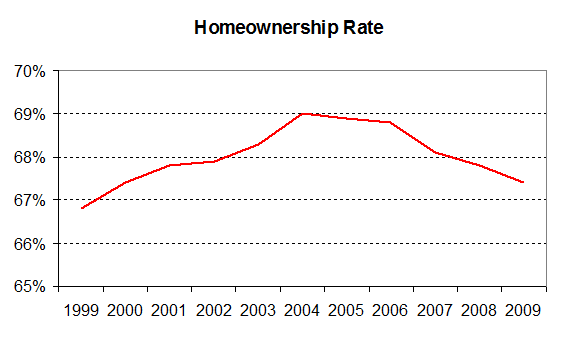 Declining homeownership is one of the single best metrics to measure our progress in burying the housing bubble. We're now moving back to a rational world where those who can reasonably afford to own a home, can, and those who cannot, rent. That's how it should be. Odds are the homeownership rate still needs to come down to flush out lingering excess, but it's clear we're moving in the right direction. And fast. Finally, there's this news from The Washington Post: "In the fourth quarter, 46 percent of borrowers who refinanced their primary mortgages brought cash to settlement to lower the balance on their loans." That was an all-time record, and the exact opposite of what went down circa 2003 to 2007, when refinancing was largely a way to cash out and draw down equity. Is there still work to do? Sure. Are consumers as healthy and protected as they need to be? For many, no. But the current state of personal finances versus the swamp many drowned in three year ago isn't even comparable. Plenty has changed -- and for the better.